Citation Information: J Clin Invest. 2006;116(1):137-145. https://doi.org/10.1172/JCI26121. V(D)J recombination of Ig and TCR loci is a stepwise process during which site-specific DNA double-strand breaks (DSBs) are made by RAG1/RAG2, followed by DSB repair by nonhomologous end joining. Defects in V(D)J recombination result in SCID characterized by absence of mature B and T cells. 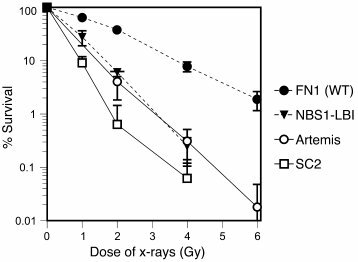 A subset of T–B–NK+ SCID patients is sensitive to ionizing radiation, and the majority of these patients have mutations in Artemis. We present a patient with a new type of radiosensitive T–B–NK+ SCID with a defect in DNA ligase IV (LIG4). To date, LIG4 mutations have only been described in a radiosensitive leukemia patient and in 4 patients with a designated LIG4 syndrome, which is associated with chromosomal instability, pancytopenia, and developmental and growth delay. The patient described here shows that a LIG4 mutation can also cause T–B–NK+ SCID without developmental defects. The LIG4-deficient SCID patient had an incomplete but severe block in precursor B cell differentiation, resulting in extremely low levels of blood B cells. The residual DH-JH junctions showed extensive nucleotide deletions, apparently caused by prolonged exonuclease activity during the delayed DH-JH ligation process. In conclusion, different LIG4 mutations can result in either a developmental defect with minor immunological abnormalities or a SCID picture with normal development. Clonogenic survival assay of fibroblasts after IR. Fibroblasts from patient SC2, the Artemis-deficient SCID patient (Artemis-1), and the NBS1-LBI cell line with an NBS1 mutation were radiosensitive. WT FN1 fibroblasts were used as normal control. Each survival curve represents the mean of at least 3 independent experiments. Error bars represent SEM.